An important aspect of the Weed Management Plan is monitoring and reporting on our interventions. This includes monitoring our weeding effort to know how our resources have been deployed, and to compare it with the requirements projected in the plan and effort in previous seasons. Regularly updated (monthly) weeding effort data are displayed on this page. 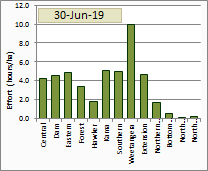 The data is accumulated from 1 July 2018. Effort for previous seasons can be accessed from the menu bar below. NB: Click your browser's reload or refresh button to make sure you are viewing the most up-to-date data. Tip: Hover mouse over chart thumbnail to see full size chart. 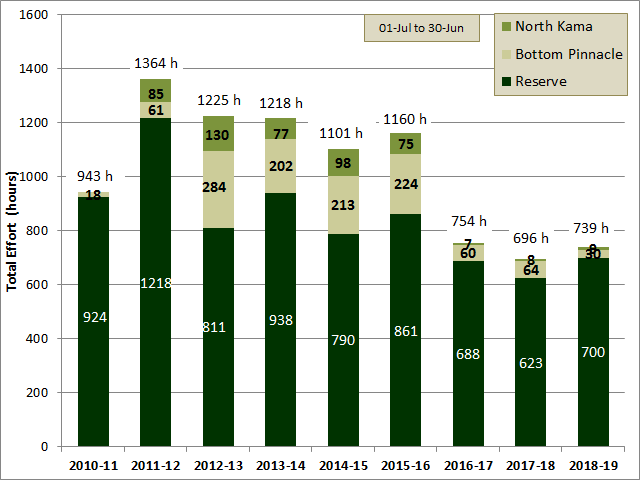 The chart shows the total effort for each of the last six seasons, divided into the time spent in the Reserve, Bottom Pinnacle and North Kama paddocks. 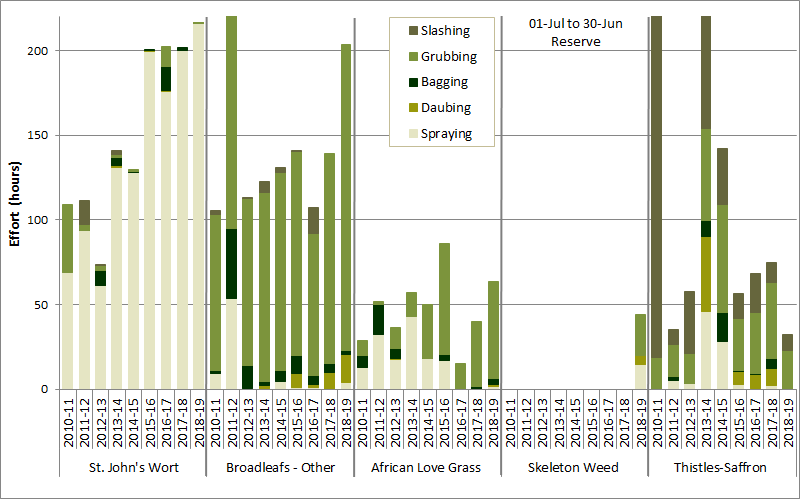 Between 1 July and 31 March the total amount of effort spent on weed control was 603 hours, 98% within the Reserve (including the Extension). This was 11% more than the total for this period last season and 20% more than the effort on the Reserve alone last season but the second lowest of our 9 seasons of records. 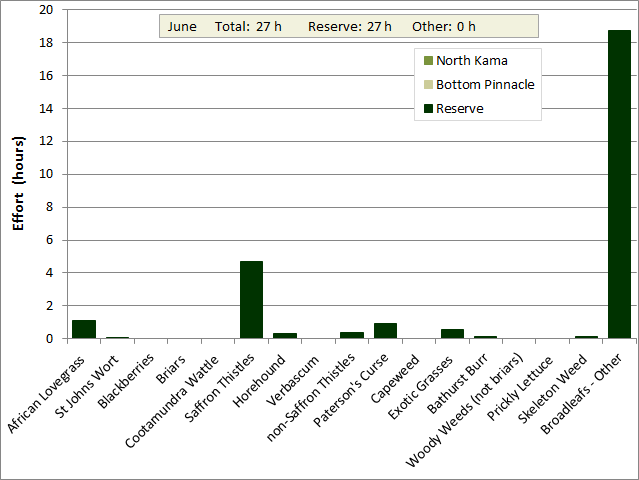 The chart shows the total effort for the most recent month each of the last six seasons, divided into the time spent in the Reserve, Bottom Pinnacle and North Kama paddocks. 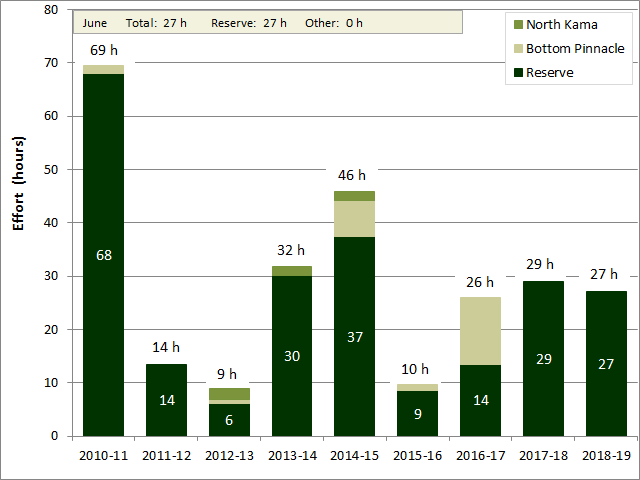 In March the total was 75 hours, 89% spent on the Reserve. This was 30% less than the previous March and the second lowest total March effort in the last 9 seasons. The chart shows the total effort for each paddock, divided into the time spent using different weed control methods. This chart shows the effort for the season to date in each paddock, separated into the time spent applying each weed control method. It can be seen that Weetangera has received the greatest effort followed by Kama, Dam, Central, Kama, Southern and the Extension paddocks. The chart shows the total effort per ha for each paddock. The areas of the paddocks differ considerably, so a better way to compare weed prevalence between paddocks is to express the effort as hours per hectare. On this basis, Weetangera maintains its clear dominance followed by Kama and Eastern, with Central, Dam, Forest, Southern and the Extension all following closely behind. 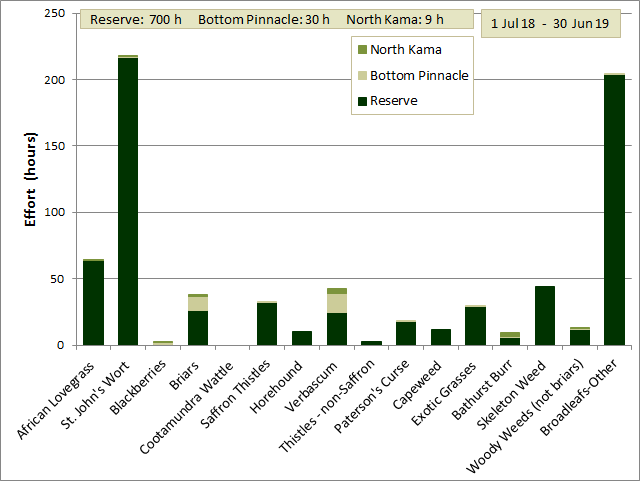 The chart shows the effort for each for the most recent month, divided into the time spent in the Reserve, Bottom Pinnacle and North Kama paddocks. The chart to the left shows the effort for each weed type for March and whether it was spent on the Reserve or on neighbouring paddocks. 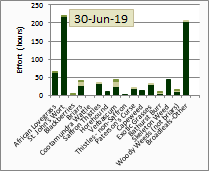 There was more diversity in effort this month as the effort on St. John's Wort scaled down and that on African Lovegrass, Briars and Verbascum scaled up. 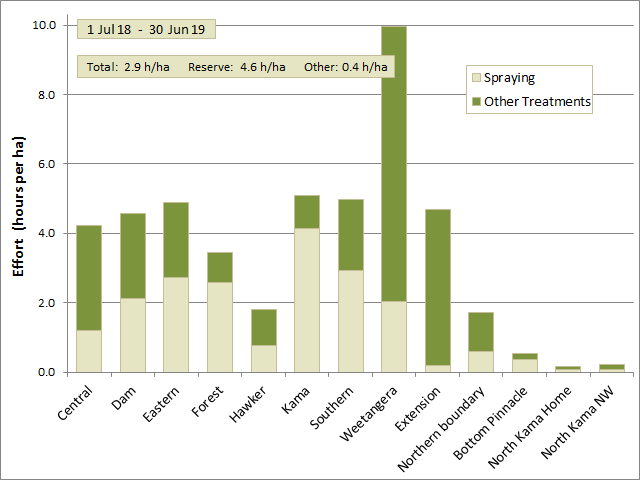 This chart shows the effort for each weed type across all paddocks for the season to date. 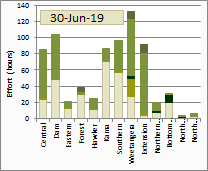 This chart shows the total effort for the season so far for each weed type and how that was distributed between the Reserve and neighbouring paddocks. St. John's Wort still stands head and shoulders above all other weeds with the most effort so far for the season to date (216 h), followed by the group of uncategorised broadleaf weeds (26 h), African Lovegrass (52 h), Skeleton weed (41 h), and Briars (31 h). Together these account for 77% of the effort so far this season. 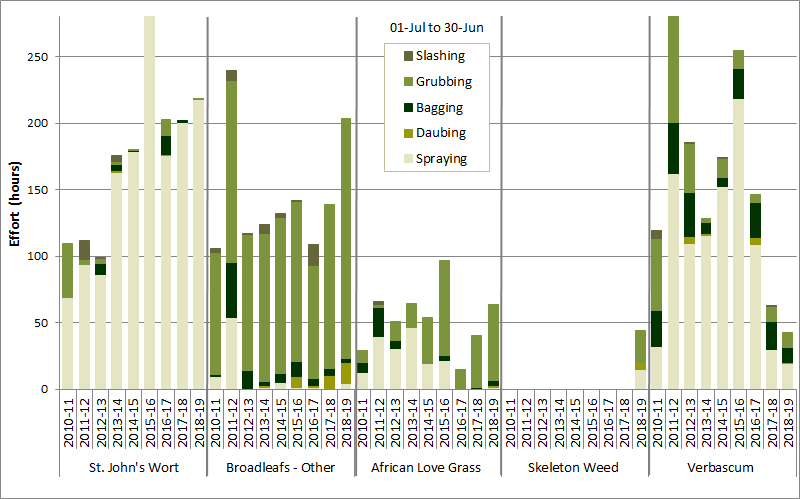 This chart shows the change from month to month of weeding effort for the different weed targets. 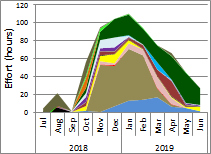 The chart to the left summarises the effort for the different weed types for each month so far this season, showing how the effort on different weed types changed from month to month. There was a large decrease in effort on St. John's Wort as the end of the second pass of the Reserve came to an end. Some of this decrease was made up for by increases in African Lovegrass, Bathurst Burr, Briars and Verbascum. These graphs show that the amount of effort on miscellaneous Broadleaf weeds and African Lovegrass exceeded that in recent seasons. 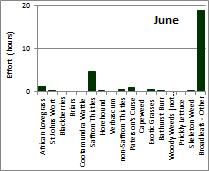 St. John's Wort effort was within the range of previous seasons in total, but exceeded the effort of all previous seasons on the Reserve. Skeleton Weed which has not been specifically targeted in previous seasons. 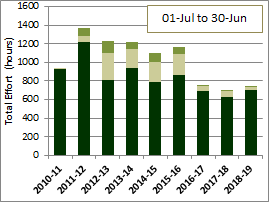 The effort on briars continues its steady decline reflecting the decline in briar numbers in response to our continued control measure. 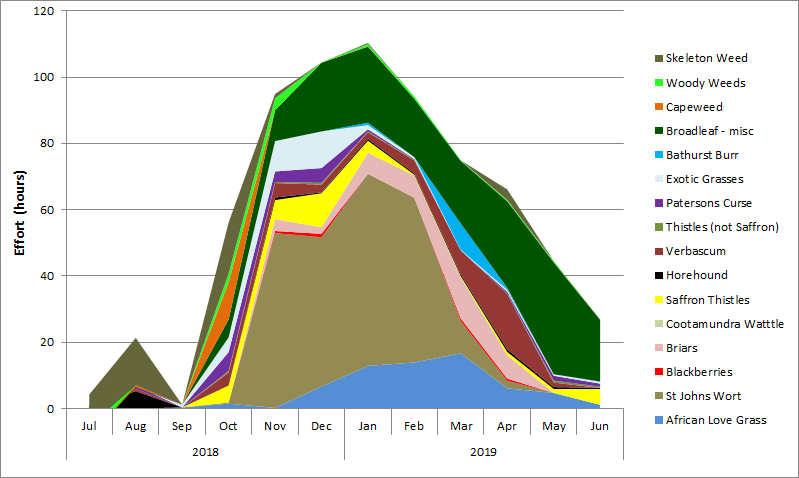 This is a useful set of graphs that show how the effort spent on each weed type in each month over the past four seasons has changed. In some cases it has increased or decreased vastly from season to season, as the prevalence of different weed types has changed from season to season (Saffron thistles being a prime example). For all weed types, though, these charts provide a guide of what is likely to be expected in coming months for each type based on previous experience. 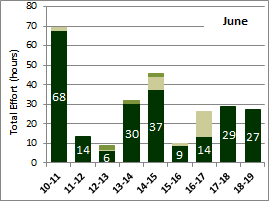 This series of charts provides a comparison, as the season progresses, of the total weeding effort to date for each weed type compared with previous seasons. At the end of the season they provide a good summary of the season's weed prevalence compared with previous seasons. Charts are available for total effort, for effort just on the Reserve, and for effort just in the neighbouring paddocks. This shows, for each paddock, the effort that has been spent in the season to date on each weed type by hovering your mouse over a paddock map. 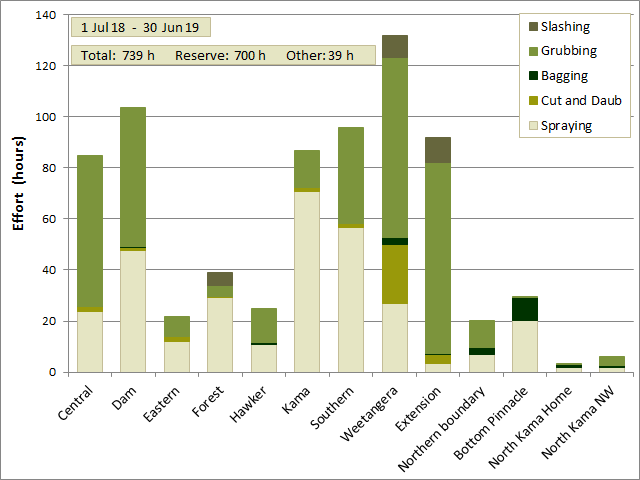 This shows, for each weed type, the effort that has been spent in the season to date in each paddock. Its effort is expressed per hectare to take into account the different paddock sizes. This allows one to judge relative levels of infestation by each weed type in different paddocks. The data can be also viewed as total effort in each paddock for each weed type by following a separate link on the page referred to above.